PFStock.com: Is Toddler Toothpaste Useless Junk? Is Toddler Toothpaste Useless Junk? Some readers know that I have a 2-year old daughter, and I will admit that this post is little bit off topic for a personal finance blog. But one thing that I wanted to talk about is toddler toothpaste. 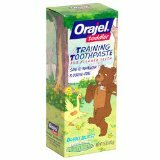 These products are sold under such names as Orajel Toddler Training Toothpaste, and Gerber Infant Tooth and Gum Cleanser. The product claims to be fluoride free and safe to swallow. But, I did my best to switch my daughter over to regular fluoride toothpaste as soon as she turned two years old. I've had issues with toddler toothpaste for a couple of reasons. First of all, toddler toothpaste has no fluoride in it, and this makes me question its usefulness. Toddler toothpastes are not accepted by the American Dental Association (ADA) as being effective in the prevention of cavities. In my view, this makes their intended purpose dubious at best. About the only real claims that the manufacturers have made is that their product tastes good, and it can be swallowed by your child. Therein lies my problem! My daughter likes the taste, and treats the toothpaste like a food. I've probably gone through a dozen mangled toothbrushes due to my daughter chewing on the toothbrush until the bristles are unrecognizable. Brushing was a constant struggle with my daughter trying to eat the toothbrush, and me trying the extract the brush from her jaws. After finally switching to a fluoride toothpaste (Kid's Crest), I had to later teach my daughter the exact opposite behavior: not to swallow the toothpaste. Swallowing too much fluoride can cause fluorosis or spots on your child's permanent teeth. Also, it was important to teach her to rinse her teeth thoroughly. This is how the lengthy process of unlearning a behavior went. In my experience toddler toothpaste has little to no benefits, and in our case only led to struggle, frustration and conflict when brushing my child's teeth. I don't know about other parents, but I would consider such a product to be defective. At this point, if I had it to do over, I would not buy any toddler toothpaste, and just use a toothbrush moistened with water until my child was two years old. Does anybody else share my opinion that toddler toothpastes are useless junk? Glad I found this post! We were buying toddler toothpaste until I realized that the first ingredient was a sugar alcohol that is also an anti-constipation aid. We'll be switching to water on a brush and also trying to teach our 18 mo. old to spit. She probably won't get it for a while, but why not start early. I've had the very same problem. I've been searching for an ADA accepted toothpaste with out any luck. I don't understand putting toothpaste with sugar on my babies teeth.